Sheffield United have completed the signing of Stoke City striker Richard Cresswell, following a successful loan spell at Bramall Lane. The 32-year-old has signed an 18-month deal for an undisclosed fee. Cresswell has scored three goals in nine starts, including the equaliser in the 1-1 draw with QPR in the FA Cup. "His knowledge of this division makes him an important presence for us," United boss Kevin Blackwell told the club's website. 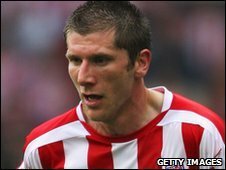 Cresswell, who was signed for Stoke in August 2007, scored 11 goals as the Potters were promoted to the top flight. But he failed to make an impression in the Premier League, scoring just one goal all season, in Stoke's 3-2 League Cup win over Cheltenham Town. The striker has also played for Leeds United and the Blades' local rivals Sheffield Wednesday.